The patient was a 46 year old man from a Cape Town township. He gave a history of severe diarrhoea and weakness. On examination he was dehydrated and shocked. He died soon after admission. 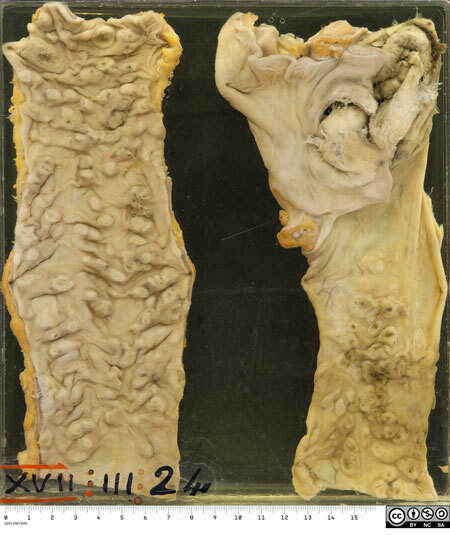 The specimen is the caecum and ascending colon, the commonest site for amoebiasis. There are multiple mucosal ulcers - these have the classical appearance of amoebic colitis. 80% of patients infected with Entamoeba histolytica will be asymptomatic. When E. histolytica becomes pathogenic, it invades the crypts of colonic glands and burrows down into the submucosa. 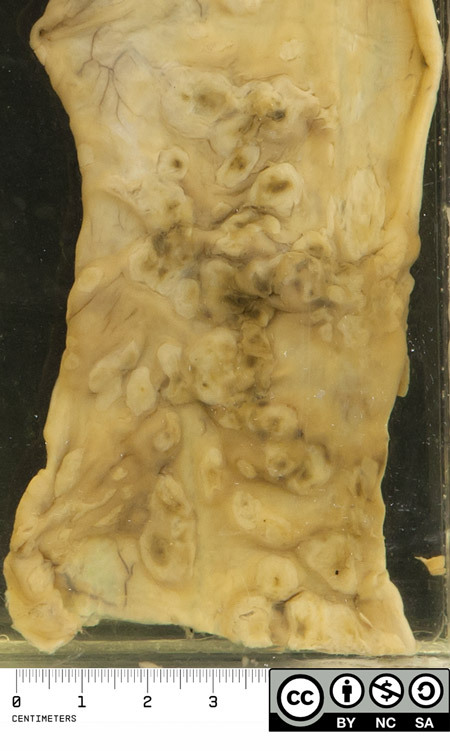 It is stopped by the muscularis propria, so then burrows laterally, and with the resulting inflammation and necrosis a flask-shaped ulcer is formed. 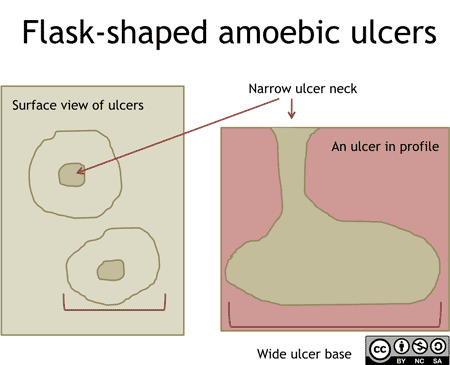 Initially the mucosa between the ulcers is relatively normal. As the ulcers enlarge they become confluent. The overlying is mucosa is undermined, and, deprived of its blood supply, it sloughs. In about 40% of patients the parasite embolises to the liver via splanchnic vessels. In our original patient the result was multiple liver abscesses. 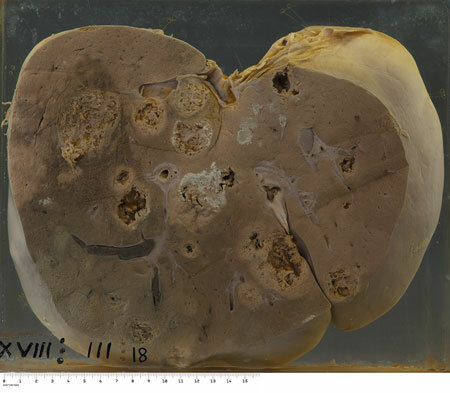 This is the external appearance of the liver. It is enlarged, weighing 3.5kg. One abscess has ruptured through the capsule. 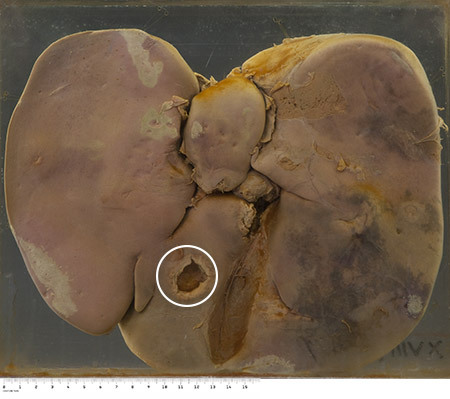 This is the cut surface of the liver. There are abscesses varying from 1 to 7cm in diameter. They have a shaggy fibrin lining. At autopsy the abscesses were filled with a typical reddish-brown liquid "sauce". Venous thrombus and a large geographic venous infarct can also be seen. On microscopy, the stool contained blood, mucus and pus cells. There were also ova of Ascaris lumbricoides and Trichuris trichuria. No Entamoeba histolytica trophozoites or cysts were seen. Examination of repeated fresh, warm stool samples (x 3) improves the detection rate of active amoeba trophozoites by microscopy. E. histolytica can also be diagnosed by specific antigen or serum antibody tests. Drainage of liver abscesses is seldom required.